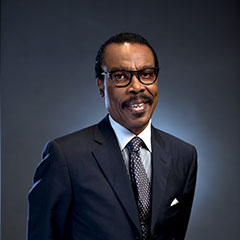 Mr. Bismarck Rewane holds a Bachelor’s degree from the University of Ibadan and is an Associate of The Institute of Bankers, England and Wales. Mr. Rewane worked with the First National Bank of Chicago (which later became the International Merchant Bank Nigeria Limited) as a General Manager and Treasurer. He has also served as a Director of both Lion Bank of Nigeria and Intercity Bank Limited. He is currently the Managing Director of Financial Derivatives Company Ltd and also serves on the Board of FCMB Group Plc, FCMB (UK) Ltd, Top Feeds Nigeria Ltd, Delta Packaging Nigeria Ltd, Seepec Nigeria Ltd, Nigerian Economic Summit Group, Modant Marine Ltd, Virgin Nigeria Airways Ltd, Nigeria LNG Foundation, UBA Custodian Ltd, UNIC Insurance Plc, Navgas (a Vitol subsidiary), and Guinness Nigeria Plc. Mr. Rewane has over 40 years experience in the financial services industry.